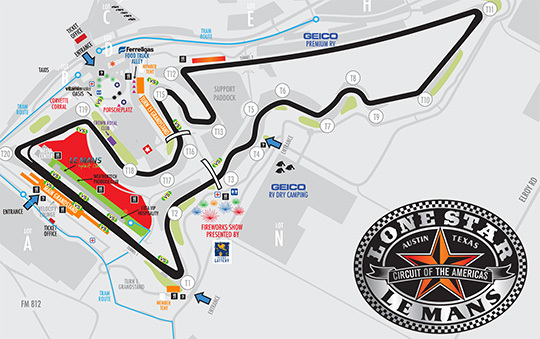 We look forward to welcoming you to Circuit of The Americas for Lone Star Le Mans! 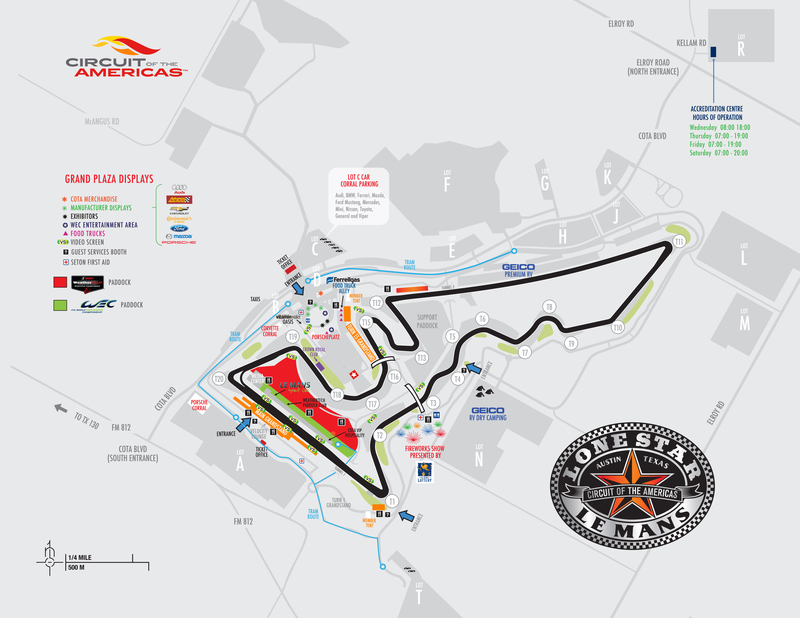 For your convenience we have compiled information below to help you get to Circuit of The Americas, navigate the venue and find all the exciting activities happening throughout all three days. Get the most out of your Lone Star Le Mans experience with the COTA App. With the schedule, map, food options and much more, it's your easy reference guide to the event in the palm of your hand. *Please note the app is still being updated and will be fully loaded by Thursday. If you previously downloaded the app, update to the latest version by opening the app and going into settings (the gear in the upper right corner). Click the "Update" button and "Reset" buttons to get the most recent version. Multi-Turn Tickets provide you access to Grandstand seating each day in Turn 1, Turn 15 and the Main Grandstand. You can customize your view of the on-track action each day by moving between these stands, or enjoying any of the general admission hillsides. The seats in the stands are general admission - you will not have an assigned seat number and can move around at your leisure. 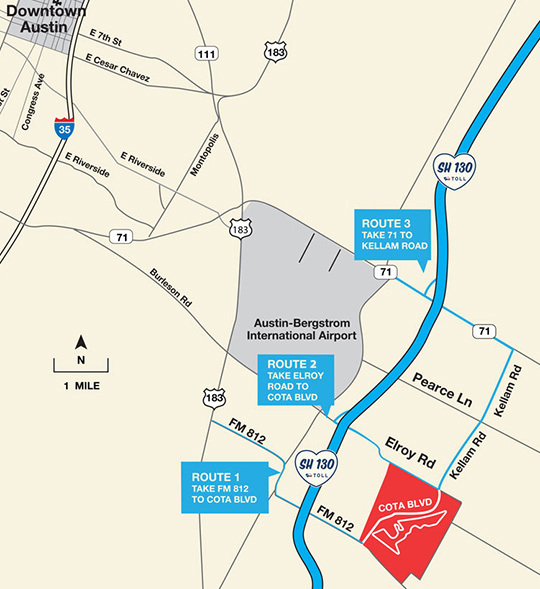 The physical address is: 9201 Circuit of The Americas Blvd, Austin, TX 78617. Please park in the parking lot designated by the parking pass you purchased. If you have not purchased parking, you may go here to purchase a 3-day parking pass now for $30, or pay $20 cash each day at the lot. ADA parking is available in our parking lots for those with a government issued ADA hangtag or license plate. If you require ADA assistance from the parking lot to your seat, please alert a staff member, such as a parking attendant. They will be able to radio an operator to dispatch a golf cart to your parking location. You can also call our ADA Cart Line directly for assistance at 512.655.6217. Download the COTA App for iPhone or Android for the most up-to-date event schedule throughout the event. You can also view the schedule at our website. *Please note the schedule is subject to change without notification. 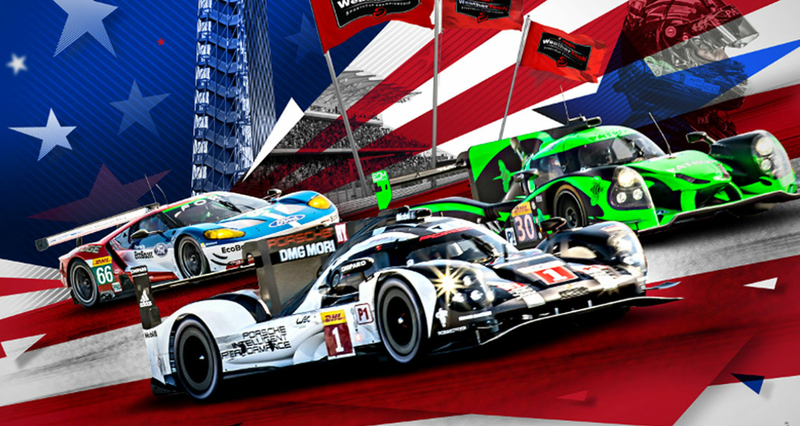 Make your Lone Star Le Mans memorabilia a collector’s item with the signature of your favorite driver. Download the COTA App for iPhone or Android for the most up-to-date autograph schedule. Click on the map to enlarge image. An open paddock means you can wander around outside the tents and garages the teams use to prep their cars. The Paddock is closed to the public during many race series, but Lone Star Le Mans opens up this area to the public. The Paddock will also have merchandise, food and beverages available for purchase. Swing by the Grand Plaza for food, fun and relaxation. Below are a couple highlights that you won’t want to miss, but don’t stop with just these. Wander around the Grand Plaza to uncover even more entertainment. Register at the Mazda activation in the Grand Plaza for the free ride and drive program Mazda is conducting in Lot H.
Escape the heat under the shade of our brand new Vitaminwater Oasis, and grab a cold drink without missing any of the racing action. TVs will display the race broadcast and the oasis offers great views of Turn 19 and Turn 20. The fun isn’t limited to the Grand Plaza. Take a stroll down the grid or through Pit Lane. On Saturday night, around 9 PM, a dazzling fireworks display will light up the sky while cars are still on the track. This unique sight has been a highlight for many race fans during the past two Lone Star Le Mans. Take a trek up the 251ft tall Observation Tower to see the track from above. Tickets can be purchased at the base of the Tower. Tickets for adults are $20, and tickets for seniors, kids and military are $15. The National Anthem presented by Texas Lottery and Texas State Marching Band will take to the grid during opening ceremonies on Saturday, September 17th, to entertain guests with strong melodies. Be on the lookout for the recognition of an Honorary Military Member selected by Crown Royal during opening ceremonies. Text "TexasLottery" to 86677 for a chance to win a ride around the track on Saturday morning. *Must have Saturday race admission for redemption. Text "PIZZA" to 86677 for a chance to win a spot in the Discover IMSA - Behind The Scenes Experience on Saturday, courtesy of Pizza Hut. *Must have Saturday race admission for redemption. The Ferrellgas Food Truck Alley features more than 15 different food options. Enjoy a delicious drink at the special Tito's Handmade Vodka Bloody Mary Bar in the Velocity Lounge. The Velocity Lounge also offers food inside its cozy lounge setting with multiple TV monitors. Guest Services Tents are located in the Grand Plaza, at the Main Grandstands, at Turn 1 and at Turn 3. Please swing by if you have a question - we're here to help! If you need assistance at any point while you're at our venue and you do not see staff nearby, shoot us a text at 69050 with "COTA" followed by your request or question. If it's a location-based inquiry, please include your location. Our guests’ safety is of the utmost importance to us. Please go here to see a full list of items that are allowed or prohibited at our venue. We look forward to a fun weekend with all of you, and welcome you to share your experience with us during the weekend with #COTA on Twitter and Instagram.